Aghio Galas, is built on the top of a rocky mountain Underneath the village there is a complex of caves. 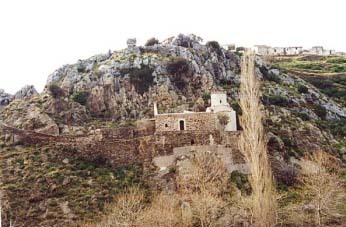 The village's name came after "the milky water" (gala=milk)dropping from the stalactites of the cave, in front of the entrance of which the church of Panaghia Aiogaloussena was built. Worth visiting is also the the square with tower and arch. Local festival on August 22.